MOLESWORTH I recorded its second victory of the season with a 77-run win over Old Beach at the weekend. Playing home, Molesworth made the competitive total of 158 with captain Jamie Adams again amongst the runs with a good knock of 77 striking seven 4s and two 6s. In reply Old Beach was bundled out for just 81. Josh Bomford was the main destroyer for Molesworth, taking 3-18 from 8 overs in a good perfomance, In fact all the Molesworth bowlers did their bit to help claim the points. Gretna I recorded its first victory of the season with a very close win over Wellington at Eady St. Gretna had first hit, making 177 with captain Ben Rainbird top-scoring with 36 (four 4s and one 6) and Aaron Maddox making 17. The pair put on 50 for the opening stand and things looked in good shape. But the score fell to 8 for 111 and a not so defensible score look likely. Corey Ransley joined Todd Jarvis at the wicket and the two vice-captains put on a valuable 52 with Ransley making 33 and hitting all but one run in boundaries with five 4s and two 6s whilst Jarvis was 27 not out. In reply Wellington was going along nicely and needed just 22 to win with four wickets in hand. Aaron Maddox came back into the attack and took three of the four to help Gretna claim an eight-run victory. Craig Cunningham also did well taking 2-28 from eight overs. In first grade, New Norfolk I went down to Old Beach by four wickets at Old Beach. The Red Caps made 173 with captain Dave Maddox batting well with 61, hitting six well struck 4s, while Stewart Rice did his usual thing, hitting a quickfire 42 with one 4 and five 6s. It looks like Rice now has his eye in for another big season. Old Beach reached the set target with the loss of six wickets. Josh Walsh and Josh Rowlands were the main wicket takers with two each. Gretna II made it a good day for the club, downing the undermanned St Virgils by eight wickets. The visitors had first hit, making a competitive total of 149. For Gretna, the new boys Zac and Luke Crosswell bowled very well taking four and one wicket respectively. Joey Eyles also got amongst the wickets with two. In reply Gretna lost just the two wickets in chasing down the total with Joey Eyles capping off a good day with a well made 62 not out. Young Jordy Hastie also stood tall making 39. Eyles and Hastie put in a 110-run partnership to set up what was a good win. Congratulations to new player Tom Gregson on playing his first game for Gretna, Tom is the 292nd player since 1977/78 and he claimed a wicket on debut. After a big win last week, Bushy Park was on the receiving end of a loss to DOSA at the small Shoobridge ground. The home side had first hit and made the huge total of 5 for 403. No Bushy Park bowlers had an impact, with the main wicket taker being new player B. Howlett who got two victims and went for 102 off his 10 overs. In reply Bushy Park made the good score of 252 with all-rounder Mitch Crosswell making 122 - a great effort to say the least. Geoff Crosswell made 31 runs and Jarrod Oates put on 85. Oates did well making 49 in his first match of the season. In fourth grade New Norfolk II went down to the Knights by nine wickets. New Norfolk had first hit and made the small total of 92 with Ashley Morgan the best with the bat and making 21 including three 4s and a 6. The Knights made light work of the run chase, getting the total with 30 overs to spare. Jamie Maddox snared both wickets to finish with 2-24. In fifth grade, Molesworth II had a washout with St Annes at Cadburys No 1. Old Beach 6 for 174 off 35.1 overs d New Norfolk I 10 for 173 off 47 overs (21 extras) at Old Beach. New Norfolk I - batting: David Maddox 61, Stewart Rice 42, Rohan Heron 16, Josh Rowlands 14, New Norfolk I - bowling: Josh Walsh 2-23 (6), Josh Rowlands 2-37 (10), Rohan Heron 1-19 (5.1), Stewart Rice 1-24 (6). Gretna I 10 for 177 off 34.5 overs (22 extras) d Wellington 10 for 169 off 43.1 overs at Eady St. Gretna I - batting: Ben Rainbird 36, Corey Ransley 33, Todd Jarvis 27 not out, Craig Cunningham 19, Aaron Maddox 17, Jackson Ackerly 11. Gretna I - bowling: Aaron Maddox 4-41 (8.1), Craig Cunningham 2-28 (8), Todd Jarvis 1-23 (6), Corey Ransley 1-35 (6). Molesworth 10 for 158 off 43 overs (13 extras) d Old Beach 10 for 81 off 30.4 overs at Boyer Oval. Molesworth I - batting: Jamie Adams 70, Daniel Adams 24, Jake King 17, Brad Coppleman 12, Cody Neads 10. Molesworth I - bowling: Josh Bomford 3-18 (8), Nathan Eiszele 2-18 (8), Jamie Adams 2-2 (1.4), Larry Menzie 1-11 (3), Brad Coppleman 1-16 (3). DOSA 5 for 403 off 50 overs d Bushy Park 10 for 252 off 46 overs (25 extras) at Shoobridge Park. Bushy Park - batting: Mitch Crosswell 122, Jarrod Oates 49, Geoff Crosswell 31, Jason Crosswell 15, Peter Madden 11. Bushy Park - bowling: B. Howlett 2-102 (10), Geoff Crosswell 1-76 (10), Danny Mason 1-92 (10). Gretna II 2 for 150 off 30 overs (37 extras) d St Virgils 8 for 149 off 39.1 overs (31 extras) at Gretna. Gretna II - batting: Joey Eyles 62 not out, Jordan Hastie 39. Gretna II - bowling: Zachery Crosswell 4-32 (9.1), Joey Eyles 2-40 (10), Luke Crosswell 1-13 (4), Tom Gregson 1-44 (10), Adam Browning 0-17 (6). Knights 2 for 92 off 19.4 overs (12 extras) d New Norfolk II 10 for 90 off 30.1 overs (16 extras) at Tynwald Park. 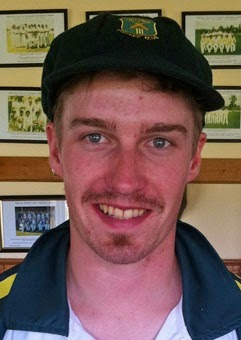 New Norfolk II - batting: Ashley Morgan 21, Richard Graham 15, Mitchell Rice 15. New Norfolk II bowling: Jamie Maddox 2-24 (6). Molesworth II v St Annes at Cadburys 1. Match was washed out.